Australia’s most senior bishops called for justice to be allowed to take its course after the former Archbishop of Sydney, Cardinal George Pell, was charged with sexual abuse offences last week. Cardinal George Pell speaks with Cardinal Peter Erdo of Esztergom-Budapest, Hungary, on 13 October, 2014. Photo: CNS/Paul Haring. Cardinal Pell, who is currently Prefect of the Secretariat for the Economy at the Vatican, was charged by Victoria Police on 29 June with a number of sexual assault offences, requiring him to appear at the Melbourne Magistrates Court on 18 July. He also emphasised that those alleging sexual abuse should be treated with respect and compassion, and that their complaints be investigated according to the law. Commenting on Pope Francis’ words of gratitude for Cardinal Pell’s honesty during his three years working at the Vatican, Archbishop Fisher stated: “Having known him for the best part of three decades myself, I can only support that judgement: the George Pell I know is a man of integrity in his dealings with others, a man of faith and high ideals, a thoroughly decent man.” The Archbishop acknowledged that the ensuing court proceedings will be “unsettling” for many people including clergy, parishioners, teachers, church –workers and parents of students attending Catholic schools. “I ask you all to pray for truth and justice in this present case, to pray for our Church at this difficult time, and to continue your prayers for all those affected by sexual abuse,” he stated. Archbishop Mark Coleridge, acting in his capacity as Vice President of the Australian Catholic Bishops Conference, said, “the Cardinal is entitled to the presumption of innocence, like any other member of the public, until his case is heard in the Melbourne Magistrate’s Court on 18 July. The Cardinal has denied all allegations. “The Archbishop is conscious of the Cardinal’s many good works which have been acknowledged both nationally and internationally. 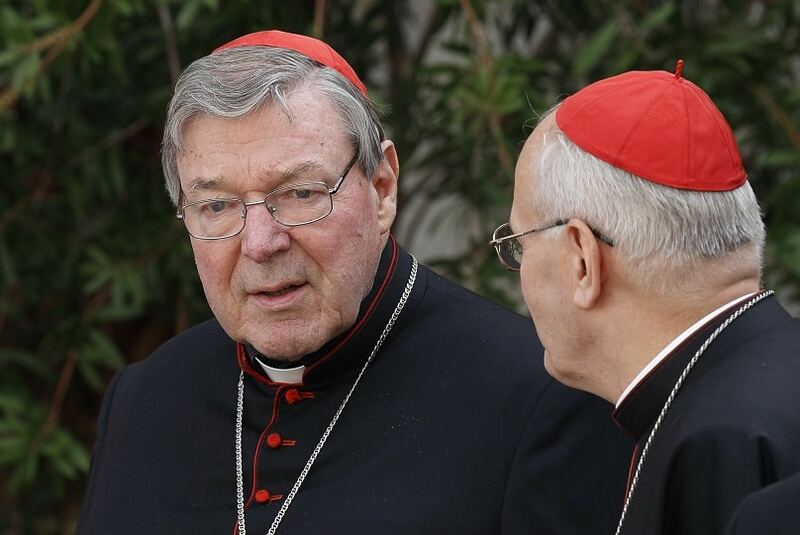 It is a matter of public record that Cardinal Pell addressed the evil of sexual abuse in the Church on becoming Archbishop of Melbourne,” the statement read. Bishop Bill Wright of the Diocese of Maitland-Newcastle called for justice to be able to take its course. “These matters have been under investigation now for nearly two years,” he said. “There have been leaks to the media, relentless character assassination and, for more than a month, claims that a decision on laying charges is ‘imminent’. “I have been consistent and clear in my total rejection of these allegations. News of these charges strengthens my resolve, and court proceedings now offer me an opportunity to clear my name and then return to my work in Rome,” Cardinal Pell concluded. The Cardinal said he had consulted with both his lawyers and his doctors in regards to his return to Australia. During the press conference, the Director of the Holy See’s Press Office, Greg Burke, read a statement expressing the reaction of the Vatican to the charges against Cardinal Pell. “The Holy See has learned with regret the news of charges filed in Australia against Cardinal Pell for decades-old actions that have been attributed to him,” Mr Burke said. “The Holy Father, who has appreciated Cardinal Pell’s honesty during his three years of work in the Roman Curia, is grateful for his collaboration, and in particular, for his energetic dedication to the reforms in the economic and administrative sector, as well as his active participation in the Council of Cardinals,” Mr Burke said. He said that the Secretariat for the Economy would continue its work during Cardinal Pell’s absence.